Huge explosions in space turn into fireballs surrounded by unexplained rings of fire/plasma that expand usually on the relative horizontal or vertical plane, often racing just past the camera. Used to make big kabooms (especially those that blow up whole planets) appear more powerful, and when spheroid shockwaves just won't do. Perhaps this is done because the expected near-spherical explosions don't feel as big, or because a two-dimensional shockwave resembles that of powerful explosions on earth. In theory, it could be Hand Waved by being an effect of the method of Artificial Gravity, or some kind of rotating generator exploding, or plasma trapped by some great magnetic field... but it usually just gets a pass due to being an awesome visual.note It should be said that a shockwave is something produced by the force of the explosion pushing air away from the epicenter of the explosion. Since there is no air in space, it is theoretically impossible for a shockwave to propagate. Very commonly used in space-based video games, as it is a relatively "cheap" and easily produced effect. Count on the hero's Cool Starship to be directly in its path by apparent coincidence, allowing him to Outrun the Fireball. Note: a spherical shockwave that is relatively transparent would look like a planar shockwave viewed from a perpendicular angle; done that way it is not this trope. See also Explosions in Space for other ways media gets explosions in vacuum wrong. In Lyrical Nanoha, if something is struck by the Arc-en-ciel, a spaceship weapon that distorts time and space to vaporize a target, it will produce these after it gets destroyed. The very first episode of Tengen Toppa Gurren Lagann has one. The destruction of the black hole at the end of DieBuster spawns a small, rainbow-colored one that promptly twists into an infinity sign before fading away. Possibly the earliest example of a planar shockwave is the self-destruction of the Nostromo in Alien (1979). From Ripley's POV, it first forms a horizontal multicolored line and then an orange sphere appears behind/inside it. A few seconds later a horizontal shockwave of material hits her ship. Star Trek VI: The Undiscovered Country, when the Klingon moon of Praxis explodes in a double shockwave ring. The effect is occasionally called a Praxis Effect after this prominent example. The shockwave actually gains plot significance here when it hits the starship Excelsior, since it makes the Federation aware of what happened. Most other examples feature the rings mostly for eye candy. The Special Editions of the original trilogy do this three times: once for each Death Star (vertical and horizontal rings, respectively) and once when Alderaan is destroyed. They weren't in the original versions. Partially justified with the Death Stars: the trench dividing the two hemispheres is weaker than the rest of the shell, which would cause a (if somewhat smaller) Planar Shockwave. However, the first Death Star exploded vertically, and the second Death Star wasn't completely built yet. Attack of the Clones takes it one step further, with the shock bombs dropped from Jango Fett's ship: The resulting explosion is focused into a thin disk shape that seems to simply cut through the surrounding asteroids. Which given that space is three-dimensional makes them extremely ineffective weapons that only work because Obi-Wan seems not to be aware of that fact. It is worth noting however that Jango used the charges specifically to blow apart the asteroids they were flying through, making the fact that he happened to have these charges very fortunate indeed.note A planar shockwave has advantages: the "blast" effect of a spherical explosion goes down with the square of the radius (4 Pi r2). If focused into a planar one, "blast" goes down with the radius (2Pi r). So if you can aim the shockwave, the mine has a much larger effective range. According to Wookieepedia, the shields on anything smaller than a capital ship would be unable to defend against these charges, supporting this idea that the planar shockwave is in order to produce a much more powerful blast. The Legends novel Death Star explains the ring produced by Alderaan as the realspace shadow of a hyperspace ripple, produced as a side effect of the Death Star's superlaser being fully charged when fired. Presumably this is also the case when the Death Star itself explodes, as it was literally seconds away from firing on Yavin IV when it was destroyed. This can also be used to explain the ring produced by the Death Star II in Return of the Jedi. According to Legends materials, the second Death Star could recharge much faster than the original, so it was likely charged to full power when it blew up.note The script and the novelization of Return of the Jedi include material which never made it to film about Moff Jerjerrod being ordered to destroy Endor if the Rebels successfully took down the shield generator, and the Death Star had indeed rotated in the direction of the moon by the time it was destroyed. Stargate features one when Ra's ship blows up. This might be acceptable given the shape of the ship. Might. A better explanation would be the fact that it was sitting on a platform, surrounded by a ring of the as-yet-unnamed material the Stargates were made of, something that was explicitly stated would enhance the blast. In fact, there are two examples from the same explosion. In the immediate detonation a streak of light appears across the screen which is exactly horizontal, despite being seen from two different perspectives (from space, where it doesn't align with either the ship or the planet, and from the ground where it aligns with the horizon). After this explosion has been witnessed by the cast, a second effect shows a more traditional Planar Shockwave, this time in the plane of Ra's ship. Independence Day features something similar as the Alien Mothership explodes: The explosion spreads horizontally on the screen, eventually engulfing the camera. Might have looked like a Praxis Shockwave from another angle. A character fails to outrun a shockwave which is half the height of her fighter craft. Despite being the squadron commander, the idea of glancing behind her and pulling up never occurs to her. Also, during the ship-to-ship battle between the Tiger's Claw and the Kilrathi ships, an enemy capital ship is hit with two torpedoes and explodes, emitting a planar shockwave that proceeds to destroy another Kilrathi ship. Apparently, traveling close together, leaving no room to maneuver, is standard operating procedure for the kitties. No wonder a single human ship was able to deal so much damage to the more advanced Kilrathi. Armageddon has one when the nuclear ordnance exploded inside the asteroid. 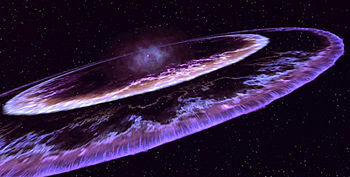 An apparent example occurs when Jupiter explodes in 2010: The Year We Make Contact, but it is made clear that it is actually the visible edge of a spherical shockwave when it catches up to the heroes' ship. The orbital laser station (the ZEUS) in Final Fantasy: The Spirits Within explodes like this at the end of the movie. A rare earth-based example occurs in The Transporter when the main character's house is blown up by the bad guys. Seriously. Seen when Krypton blows in Man of Steel. Somewhat played for laughs when the trope is used while Asgard is being destroyed in Thor: Ragnarok. In the Cities in Flight science fiction novels by James Blish, there is an explosive TDX that only explodes perpendicular to the local gravity field. In Neal Asher's books set in the Human Polity, there exist planar explosives which are allegedly the product of molecular engineering, which produce 2D blasts. Stargate Atlantis uses a planar shockwave when the Asuran homeworld explodes. Not to mention every exploding wraith ship. Bonus points for making nearby ships explode too. In a Space Cases episode, the two-dimensional shockwave of two exploding Spung battlecruisers (due to double Deadly Dodging) destroys the third one. Narn energy mines in one of Babylon 5's space battles. A spectacular one is seen at about 40 seconds into the opening for Power Rangers Lost Galaxy. Heavy bombs and capital ship explosions in FreeSpace and its sequel. The "randomly oriented" part is only when 3D shockwaves are enabled in the updated FreeSpace 2 Open engine. In the original games they were always oriented so you saw the "ring" head-on. In the first game in the series, the shockwaves even looked spherical. The explosion effect, however, is spherical. In Homeworld: Cataclysm, Kiith Somtaaw's Wave Motion Gun creates one of those upon impact. Also used for explosions of the largest class of spaceships. Explosions have spherical effects, however, regardless of the visual. Tactical battles in Master of Orion 3 use these for capital ships. Star Trek: Armada, Star Trek: Starfleet Command and their respective sequels make frequent use of them. In Starfleet Command, the same planar shockwave effect is used for every ship above the fighter class. Rogue Squadron and its sequels feature these whenever a starfighter explodes in mid-air. Shows up in the explosion of Zebes in the ending to Super Metroid. We also see Zebes exploding in the same way, but with cooler visuals, in the Adventure mode of Super Smash Bros. Melee. In Sword of the Stars, tactical battles use these. They are actually weaponized by Chakkars/Chakrams, where the planar shockwave is used to slice through armor. In Tachyon: The Fringe, all spaceships go down with shockwave rings, more noticeable on large ships. While most explosions in the Escape Velocity series will just be the usual yellow-orange-red atmospheric looking fireballs, the very most awesome ships and weapons exploding will make planer and ring shockwaves in pretty colors. Also seen on the splash screen of EV:Nova. In Star Fox Adventures, most spaceships in the game blow up like this. This is especially apparent when Andross's head explodes at the end of the game exactly like the Death Star did, complete with ship's outrunning the fireball. In Serious Sam, rockets, grenades, cannonballs and laser beams send Planar Shockwaves of various sizes along the surface they explode on. Wing Commander Prophecy uses an upgraded graphics engine compared to previous games, and is the first game in the series to use 3D acceleration. Among the new visuals is a planar shockwave effect that randomly occurs when a fighter craft explodes. The orientation of the effect appears to be random. The Stinkowing in Stinkoman 20X6 causes a few when it explodes. A number of the graphics used for larger explosions in the X-Universe games do this. In the Xbox version of Crimson Skies (High Road to Revenge), this happens when you blow up zeppelins (despite being filled with helium). Veigues: Tactical Gladiator plays this straight with the enemy battleship's explosion in the ending cutscene. Wonder Boy in Monster World has one at the end after the hero teleports off the planet. In Star Trek Online, visual planar shockwaves result from a number of different types of explosions, though in most cases the actual force of the explosion radiates in all directions. Probably the most commonly seen is the death animation of Romulan warbirds. They get sucked into their own drive singularity, which then explodes in a green planar shockwave as it decays. Star Soldier R includes a planer shockwave in the ending cutscene. Treasure Planet: Battle at Procyon: Explosions large enough to damage multiple ships have this effect, most notably, the bombs from Star and Nova Mortars. Pulsars in FTL: Faster Than Light rapidly emit ionization in the form of white rings growing outward towards your ship. Homestar Runner: According to the Strong Bad Email "hremail3184", Strong Bad enjoys (causing) these, enough that he considers "coolest explosion I ever saw that had one of those blast-wavy Saturn rings around it that've become so popular lately." as an entire category of the best explosions he's ever seen/caused. "Tony's gonna be pissed. He hated it when Lucas added those equatorial rings to the Death Star explosions." In Darths & Droids, which loosely follows the plot of the Star Wars movies, the shockwave bombs from Attack of the Clones make their appearance. One player explains that they might work like that because of the inverse square law — by concentrating the force into a ring, more damage is done by the ring. In effect, Jango is sacrificing accuracy for power. Appears in an extreme long-distance panel in Schlock Mercenary, when the F'Sherl-Ganni (Gatekeepers) decide to deliberately detonate the t'okjith (trans: "very clever, but extremely dangerous thing"; a toroidal singularity trapped in the heart of a star) that was powering one of their buuthandi (trans: "very expensive thing"; sort of a Dyson Sphere made up of habitats slung on giant solar sails — which is actually closer to Dyson's original concept than a solid shell) while under attack from Fleet Admiral Breya Andreyasn's forces, with their cheap wormgate-copy systems producing a ridiculous amount of missiles to force said fleet into the shockwave, with the intention of over-awing the "lesser species" by totally annihilating a multi-national fleet. The fleet escapes. Justified by putting gravity-control devices out in the system's Kuiper Belt to ensure that when it does blow, rather than the star acting as a giant frag grenade, it rips the fabric of space/time a new one in one particular plane. The intro of the Second Reality demo does this in homage to the aforementioned Praxis explosion. The shockwave ring from the first Death Star's destruction is carried over into the parody of the scene in The Powerpuff Girls. The Transwarp Wavefront in Beast Wars created from the exploding Vok Weapon was plot-significant throughout the second season. It not only spread outward all the way to Cybertron, but traveled into the future as well. In Code Lyoko, the main weapon of Megatanks is a vertical planar shockwave. In one episode, they tried a horizontal one. It was never used again. In My Little Pony: Friendship Is Magic, Rainbow Dash causes a rainbow-striped planar shockwave upon performing the Sonic Rainboom. Because stars involved rotate at high speeds, collapsars (a form of hypernova) tend to form hourglass-and-ring shapes. Other supernovae look like this because the brightest ejecta forms a thin shell. You can barely see the part that's coming straight at us, but the edges (where our view is tangent to it) look very bright. SN 1987A is a good example of this, though it's a subversion in that the supernova brightened an already-existing ring of material. In the 1950's, the Orion Project studied different ways of directing nuclear explosions. Certain configurations do produce planar outflows of plasma (consider a column of high-density gas in a vacuum. It can only expand towards the sides). There are also fireworks that have this sort of effect. Whenever a black hole eats a large enough star. The dying star, as it sinks below Roche's Limit and gets torn by the tidal forces, gets spread into a ring structure around the black hole, called an accretion disk. The often relativistic rotation of the hot electrically charged plasma in it creates huge magnetic fields and electric currents in the direction perpendicular to the disk's plane, ejecting all the matter in the black hole's polar region in two enormous relativistic jets, sometimes attended by the powerful bursts of gamma radiation. These "explosions" often continue for days until the whole star is consumed. Some anti-aircraft missiles work kind of like this. Instead of simply exploding, the missile's warhead will propel an expanding ring of flying rods that can cut an airplane in half. Read more here.